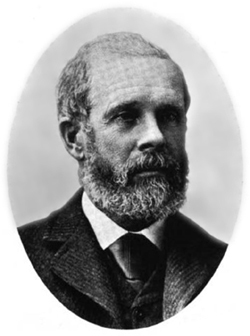 James Kennedy was born at Armagh, Ireland, September 9, 1832. and emigrated to Canada when he was 17 years old. He first settled in Brampton, Canada, but soon thereafter moved to the United States. He first took residence in Michigan City, Indiana. In the spring of 1854 he moved to Ionia, Michigan. Soon after his arrival to Ionia at the age of 22, he partnered with his cousin, Henry J. Wilson, and opened up a mercantile business. Two years thereafter, he married Eliza A. Moseman. It soon became apparent that James Kennedy would become one of the most influential pioneer residents of Ionia. Not long after his marriage, Kennedy severed his business ties with Wilson, and established a new business relationship with A. F. Carr, the proprietor of a large general store in the Union Block area. Four years thereafter, in 1860 James Kennedy ventured privately on his own. He opened a private bank, one of the first of such institutions in that part of Michigan. Quickly after he opened his bank, Kennedy realized that there wasn’t enough small change in circulation to meet his customers needs. As was the case with many businesses of the time, Kennedy solved this problem by having private tokens struck, and issuing them at a value of one-cent from his bank. Later, as the country’s small change shortage abated, Kennedy began redeeming his private tokens for U.S. cents. 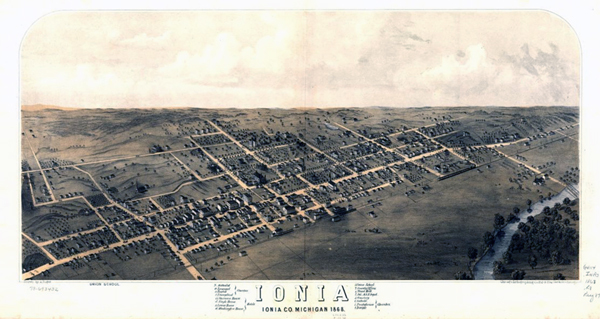 In 1864 the First National Bank of Ionia was established. Kennedy was quickly elected cashier of the new bank. In 1867 James Kennedy began lumbering operations on the Muskegon river near the village of Hersey, where he also established a large general store. In addition to his own lumbering and general store ventures, Kennedy also formed a partnership with Delos A. Bledgett and formed the lumber firm of Bledgett & Kennedy. In 1875 Kennedy became interested in Texas properties and focused all of his time to those interests until 1893. At one time he was managing a ranch consisting of more than 30,000 thousand head of cattle. After one of Kennedy’s business defaulted, he closed his enterprises and opened a coal mine in Rippey Iowa. 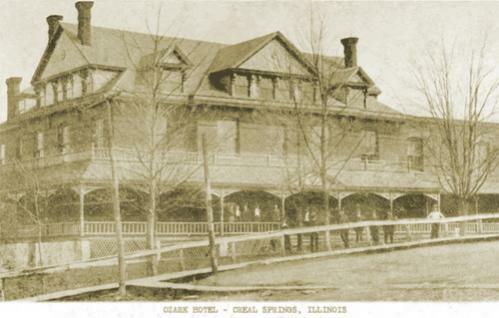 In 1893 Kennedy accidentally fell down the shaft of the elevator at the Ozark hotel in Creal Springs, Illinois. The 50 foot drop permanently disabled him. Not to be hampered by this tragedy, Kennedy quickly resumed his business endeavors and traveled the U.S., as the needs of his coal business required. 8 years thereafter, on August 31st 1901, Kennedy died just shy of his 69th birthday. Kennedy had three survivors, his wife Eliza, a son and daughter; Harriet K., wife of George E. Nichols, and Henry J. Kennedy. Below please find an 1863 Civil War Token, MI495A-1a. 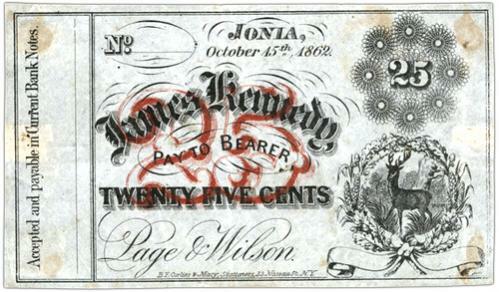 This specimen is an example of the private 1-cent tokens that James Kennedy issued. 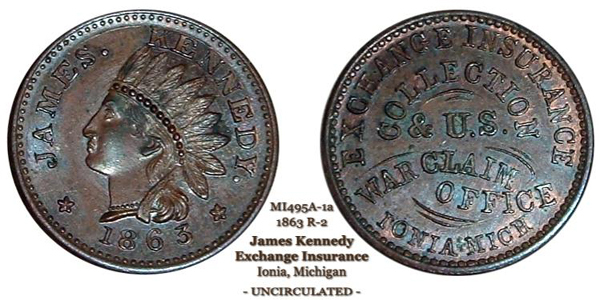 These were issued at his Ionia bank when there was a shortage of US-issued cents. Fuld estimates that this particular variety has a rarity rating of R-2. Its planchet exhibiting pleasing hues of blue, browns, and red, the specimen grades at Uncirculated or higher. To determine value, I’d need to see good photographs of the token you have. If you peruse to the ‘Contact’ section of the website, you can send the photos to that address and I will be happy to take a look.